Home > Your Questions > What Materials Are Required To Shrink Wrap a Scaffold? Although there are specialist contractors who provide a full ‘supply and fix’ shrink wrapping service, many scaffolders and construction contractors also buy scaffold shrink wrap materials to install using their own teams. Shrink Wrap – Typically 7m wide x 15m long roll. Divide the square meterage of the area to be covered by 90 to calculate the number of rolls you will need for your project. 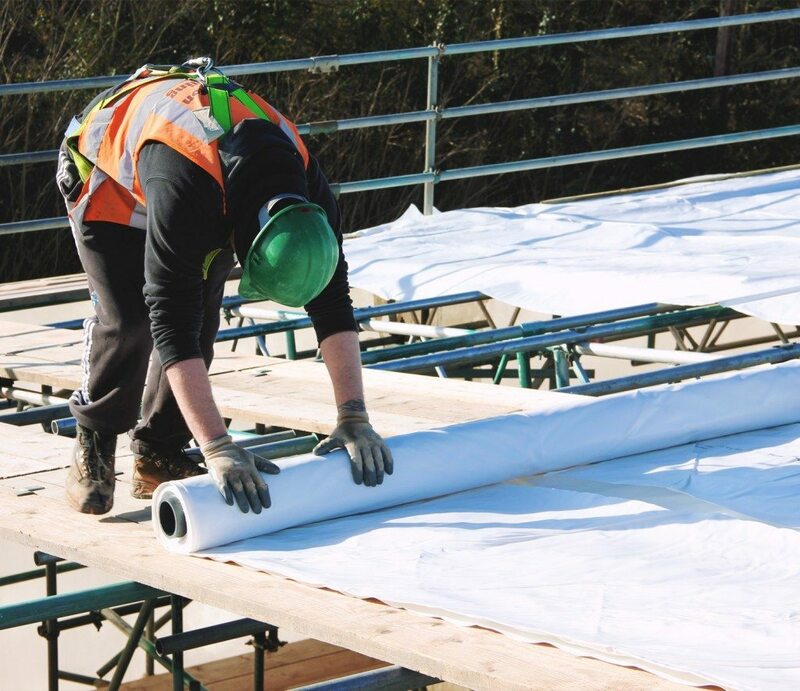 We supply Rhino Verisafe® 7m x 15m at £186 / roll or £1.77 / m2 for a 300 micron thickness, flame retardant roll. 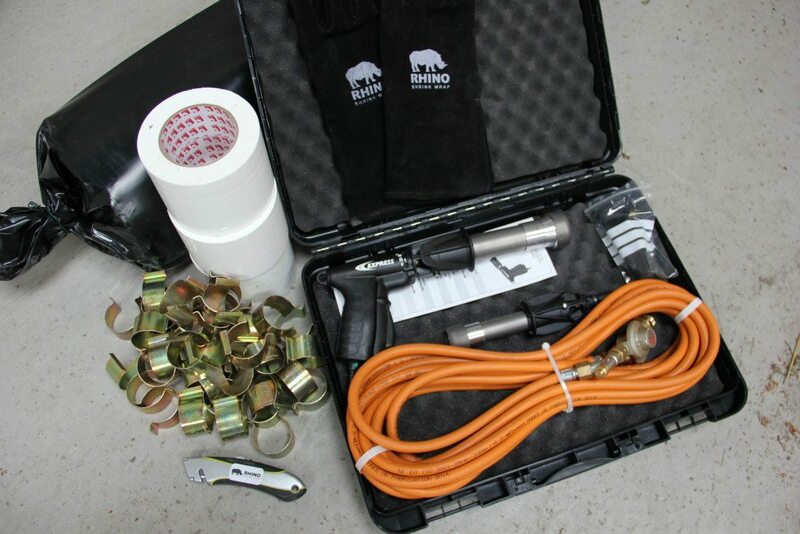 Hot Air Gun – Expect to pay from £395 for a ready to use shrink wrap gun kit including hose, regulator and case. Patch Tape – 100mm wide x 33m long roll in white – £9.95 / roll. Using a good quality shrink wrap will minimise the amount of tape you need. 1 roll of tape per roll of shrink wrap sheeting is a good ‘rule of thumb’. For more in depth information on buying your first start up kit of materials and equipment for scaffold shrink wrapping read on….. 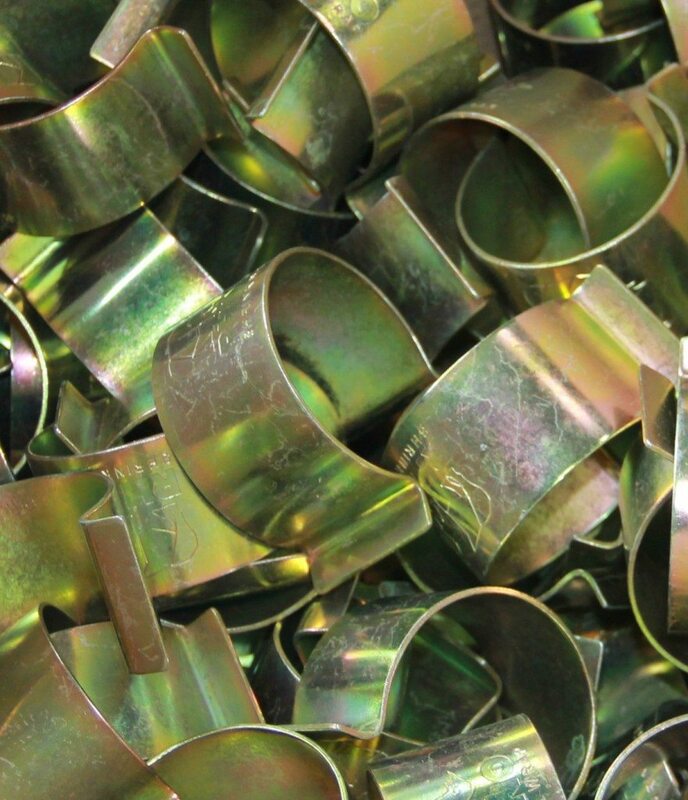 Supplied as a 7m wide x 15m long roll, (105 square metres per roll), weighing around 30Kg. The shrink wrap sheeting is generally folded down on to a roll that is 1.8m long for transport. 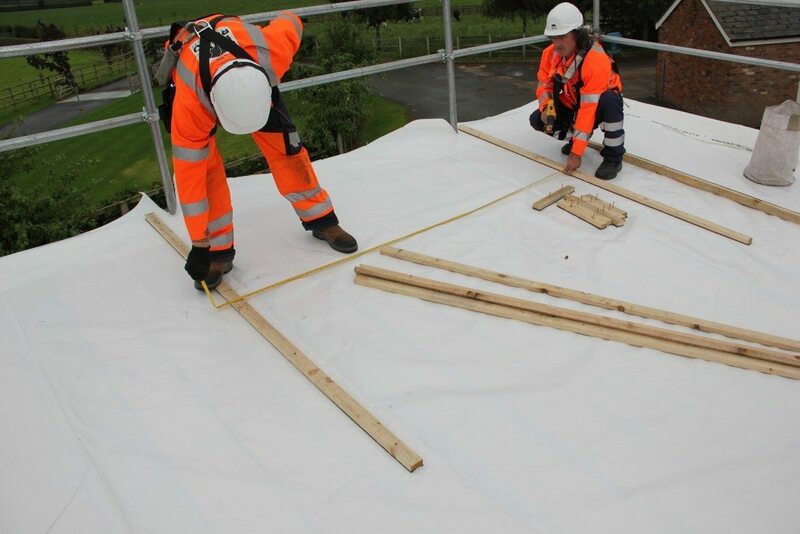 Shrink wrap for scaffolds is generally supplied in white but your supplier may be able to provide a scaffold shrink wrap in clear if you require. Although a 7 metre wide shrink wrap film has become the most common size for scaffolds, you may see a 12 metre wide scaffold shrink wrap film offered by some suppliers. Whilst a 12 metre wide shrink wrap can be useful for some applications (such as temporary roofs) the extra roll weight (nearly 55Kg) makes it more awkward to handle on site and it may not be as easy to shrink as tightly as a 7 metre wide wrap. Flame retardant shrink wrap has become the standard for scaffold sheeting applications. Your sheeting should be accredited flame retardant to EN13501 as standard but some construction sites will require that any temporary protection materials are certified flame retardant to the more extensive LPS1207 and LPS1215 flame retardant standard. Using a shrink wrap film that is not flame retardant to the requirements laid down by a construction site might lead to the insurance cover being invalid in the event of a fire. The shrink wrap sheeting is the most important element of a shrink wrap encapsulation and containment project and so it is important to get it ‘right’. The challenge when buying shrink wrap film is that different brands look almost identical when they are folded on the roll; you will only notice the difference when you are using it on the job and by that time it is too late to change. Supplier’s only publish the best pictures of shrink wrapped buildings on their website! Even the worst film will be OK if installed on a calm day and may even look pretty good immediately after installation. However, the real test of a scaffold wrap film is what the encapsulation looks like in 1 or 2 months and that is when the quality makes a difference. Unfortunately, the only way to be sure you are buying the right product is to do your homework – read the supplier’s website, ignore the bland sales messages and self promotion and choose a supplier who presents and unbiased view of their products. For an in depth article on shrink wrap quality click here. 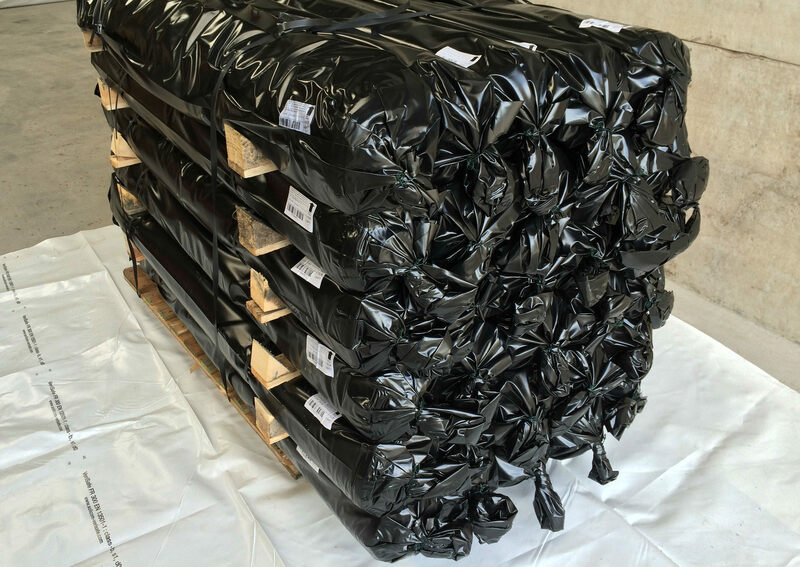 Most suppliers will offer a discount on shrink wrap film at the pallet quantity. For a 7 x 15m roll which weighs around 32Kg, the pallet quantity will be around 30 rolls. Try and order sufficient materials to complete the job. Although there is theoretically 105 square metres of shrink wrap sheeting on every roll, you should budget for getting around 90 square metes of sheeting after allowing for overlaps and offcuts. The size and weight of shrink wrap rolls means that they are generally shipped on a wooden pallet. This is great for delivering orders weighing up to 1000Kg but can be expensive for smaller orders. If you require just 1 or 2 rolls ask your supplier if they can deliver them via a courier as this will save you money on your delivery. The metal clips are used to temporarily hold the shrink wrap sheeting in position before it is welded / joined back on to itself. They are re-usable and so long as they are deigned to fit around a standard scaffold pole. In our experience there is not much difference between the clips available from different suppliers so get the best deal you can. Clips are normally supplied as a box of 100 but if you are just getting started, ask your supplier to break a box for your start up kit and just get 50. Typically supplied as a 100mm wide x 33m long roll. 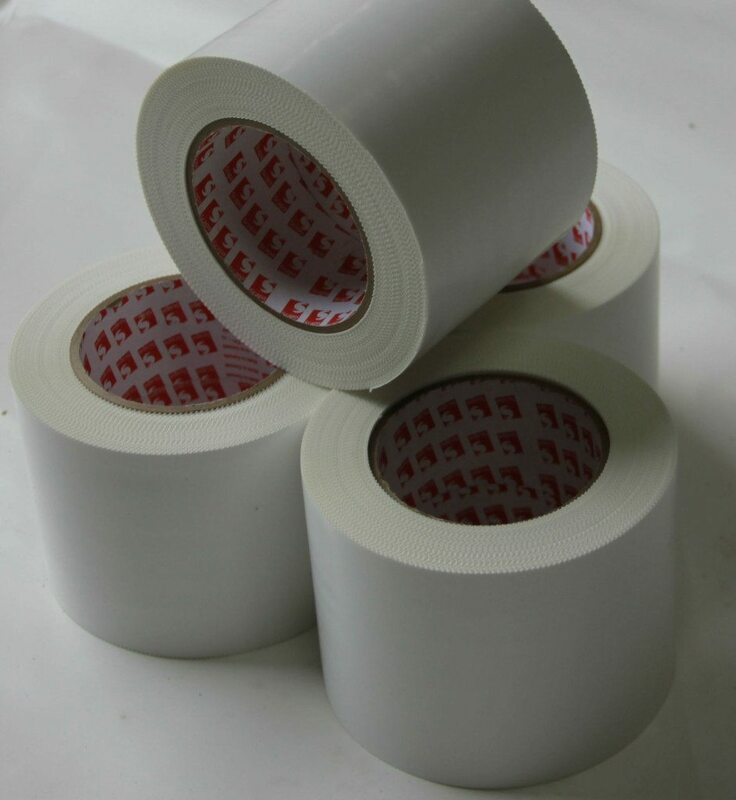 The shrink wrap repair tape or patch tape as it is sometimes known is usually supplied in white to make any repairs as ‘invisible’ as possible. However, if you are using a clear shrink wrap film, then you should ask for a clear shrink wrap repair tape. Using a good quality scaffold shrink wrap film will minimise the amount of tape you need but some tape is always needed for repairing small holes or sealing the shrink wrap where protrusions pass through the shrink wrap film. The tape that you use should have a high tack adhesive that will stick to the scaffold shrink wrap film in all weathers and temperatures. A ‘pinked’ edge to to the tape can make the tape easier to tear by hand but this is not absolutely essential. The essential piece of equipment for scaffold shrink wrapping is the propane gas shrink wrapping heat gun. This tool connects to a cylinder of propane gas via a 8 or 10m hose. A regulator on the gas bottle supplies the gas at the required pressure and also provides a safety cut out should the hose be cut, to prevent the gas escaping. 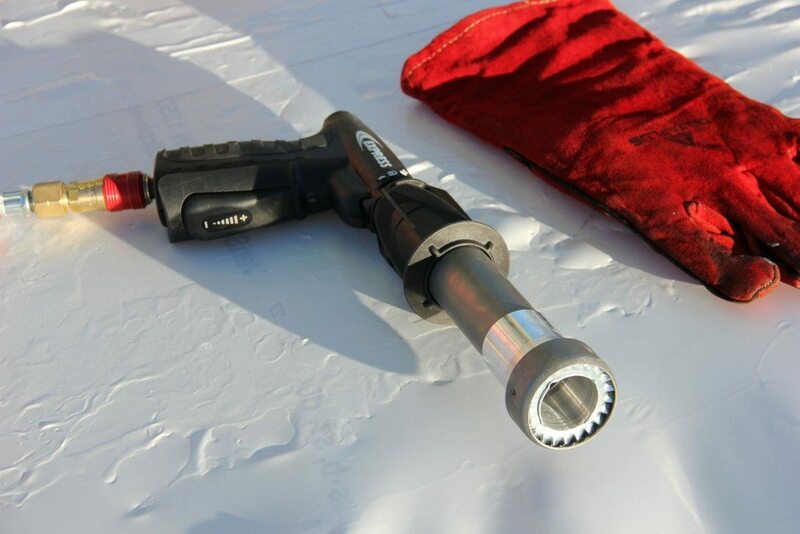 The shrink wrapping heat gun is not a specialist tool just used for the shrink wrapping of scaffolding. It is most commonly used for the shrink wrapping of plastic film around pallets and so can be found in thousands of factories around the UK. Neverthless, if you are looking at purchasing a ‘start up kit’ for scaffold shrink wrapping there are a number of features you should consider. Weight – How heavy is the heat gun? A lighter gun will be more comfortable to hold for extended periods such as required when shrink wrapping. Power – Most propane gas shrink wrapping guns are powerful enough for scaffold shrink wrapping. Although it is tempting to think that more power is better, unless your teams are highly experienced, they may not be able to take advantage of that high power and of course a higher powered gun will use more gas. Some of the most powerful shrink wrapping guns use almost twice the gas of the lowered powered models. Hose length – Try and choose a heat gun with a 10 metre long hose. Case – Choose a heat gun that is supplied with a hard carry case. Spares – Although shrink wrap guns are industrial tools and designed accordingly, they will require maintenance from time to time. Make sure your supplier carries spare parts for the guns they supply and are knowledgeable in basic repairs and maintenance. Can I use an electric heat gun? We are often asked by scaffolders and contractors if they can use an electric heat gun. Well, you can but the low power of the majority of electric heat guns makes them all but impossible to use for large scale shrink wrapping such as the encapsulation and containment of scaffolding. The only electric heat gun of practical use is the Leister Forte S3 but given it requires a 3 phase power supply and is still very slow, (not to mention 4 x the price). Everybody knows how to install Monarflex sheeting but using shrink wrap is more of a specialised trade and given that it involves the use of a hot air gun, some training is advisable. The training should of course cover the basic skills such as welding / joining sheets and shrinking the film. However, you might find it more valuable if at least part of the training is on a real life project. One of the great benefits of shrink wrap sheeting is that it is so versatile but that also means it is difficult to provide training for every scenario. Be wary of any scaffold shrink wrap company who claim to be the manufacturers of the shrink wrap film. The fact is that the machinery required to produce shrink wrap films for scaffold sheeting is huge (and hugely expensive). This means that it is limited to a small number of polythene manufacturers around the world. We are puzzled by this need to pretend they are larger than they are – after all in thousands of industries a middle man is needed to buy in bulk from the manufacturer, hold stock and distribute to customers at their required volume. The distributor also holds the knowledge and expertise regarding the specific application of the product and should be there to provide a level of support that the manufacturer would not be interested in doing. At Rhino we have always been completely transparent about the manufacturer of our film as we have a very long term and well established relationship with them. We think that if a distributor is lying to it’s customers about being the manufacturer, what else are they lying about?